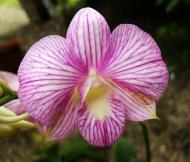 Orchidaceae (or Orchid family) is the largest family of the flowering plants (Angiospermae). Its name is derived from the genus Orchis. The Royal Botanical Gardens of Kew list 880 genera and nearly 22,000 accepted species, but the exact number is unknown (perhaps as many as 25,000) because of taxonomic disputes. The number of orchid species equals about four times the number of mammal species, or more than twice the number of bird species. It also encompasses about 6-11% of all seed plants. 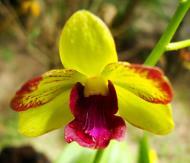 About 800 new orchid species are added each year. The largest genera are Bulbophyllum (2,000 species), Epidendrum (1,500 species), Dendrobium (1,400 species) and Pleurothallis (1,000 species). The family also includes the Vanilla (the genus of the vanilla plant), Orchis (type genus) and many commonly cultivated plants like some Phalaenopsis or Cattleya. Moreover, since the introduction of tropical species in the 19th century, horticulturists have more than 100,000 hybrids and cultivars. 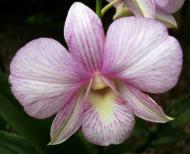 Orchidaceae are cosmopolitan, occurring in almost every habitat apart from deserts and glaciers. The great majority are to be found in the tropics, mostly Asia, South America and Central America. They are found above the Arctic Circle, in southern Patagonia and even on Macquarie Island, close to Antarctica. This family is totally recognised, and the APG II system of 2003 places it in the order Asparagales. The taxonomy of this family is in constant flux, as new studies continue to identify more classificatory elements. Cypripedioideae: 5 genera and 130 species, from the temperate regions of the world, as well as tropical America and tropical Asia. 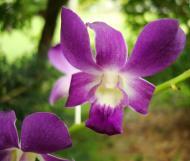 A majority of orchids are perennial epiphytes, which grow anchored to trees or shrubs in the tropics and subtropics. Other species are lithophytes, growing on rocks or very rocky soil, or are terrestrial. Nearly all temperate orchids are terrestrial. Some orchids, like Neottia and Corallorhiza, lack chlorophyll and are unable to photosynthesise. Instead, these species obtain energy and nutrients by parasitising soil fungi through the formation of orchid mycorrhizas. The fungi involved include those that form ectomycorrhizas with trees and other woody plants, parasites such as Armillaria, and saprotrophs. These orchids are known as myco-heterotrophs, but were formerly (incorrectly) described as saprophytes due to the belief that they gained their nutrition by breaking down organic matter. While only a few species are achlorophyllous holoparasites, all orchids are myco-heterotrophic during germination and seedling growth and even photosynthetic adult plants may continue to obtain carbon from their mycorrhizal fungi. 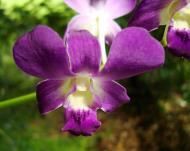 Orchids are easily distinguished, as they share some very evident apomorphies. Among these: bilaterally symmetric (zygomorphic), many resupinate, one petal (labellum) is always highly modified, stamens and carpels are fused, and the seeds are extremely small. Like most monocots, orchids generally have simple leaves with parallel veins, although some Vanilloideae have a reticulate venation. They may be ovate, lanceolate, or orbiculate and very variable in size. Their characteristics are often diagnostic. They are normally alternate on the stem, often plicate, and have no stipules. Orchid leaves often have siliceous bodies called stegmata in the vascular bundle sheaths (not present in the Orchidoideae) and are fibrous. The structure of the leaves corresponds to the specific habitat of the plant. Species that typically bask in sunlight, or grow on sites which can be occasionally very dry, have thick, leathery leaves and the laminas are covered by a waxy cuticle to retain their necessary water supply. Shade species, on the other hand, have long, thin leaves. The leaves of most orchids are perennial, that is they live for several years, while others, especially those with plicate leaves, shed them annually and develop new leaves together with new pseudobulbs, as in Catasetum. 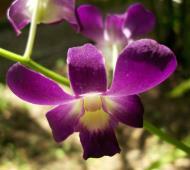 The leaves of some orchids are considered ornamental. The leaves of the Macodes sanderiana, a semiterrestrial or lithophyte, show a sparkling silver and gold veining on a light green background. The cordate leaves of Psychopsiella limminghei are light brownish green with maroon-puce markings, created by flower pigments. The attractive mottle of the leaves of Lady's Slippers from tropical and subtropical Asia, (Paphiopedilum) is caused by uneven distribution of chlorophyll. Also Phalaenopsis schilleriana is a lovely pastel pink orchid with leaves spotted dark green and light green. The Jewel Orchid (Ludisia discolor) is grown more for its colorful leaves than its fairly inconspicuous white flowers. Some orchids, as Dendrophylax lindenii (Ghost Orchid), Aphyllorchis and Taeniophyllum depend on their green roots for photosynthesis and lack normally developed leaves, as do all of the heterotrophic species. * Monopodial: The stems grows from a single bud, leaves are added from the apex each year and the stem grows longer accordingly. 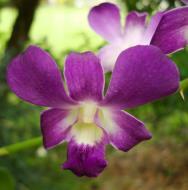 The stem of orchids with a monopodial growth can reach several metres in length, as in Vanda and Vanilla. * Sympodial: The plant produces a series of adjacent shoots which grow to a certain size, bloom and then stop growing, to be then replaced. Sympodial orchids grow laterally rather than vertically, following the surface of their support. The growth continues by development of new leads, with their own leaves and roots, sprouting from or next to those of the previous year, as in Cattleya. While a new lead is developing, the rhizome may start its growth again from a so-called 'eye', an undeveloped bud, thereby branching. Terrestrial orchids may be rhizomatous or form corms or tubers. The root caps of terrestrials are smooth and white. Some sympodial terrestrials, such as Orchis and Ophrys, have two subterranean tuberous roots. One is used as a food reserve for wintry periods, and provides for the development of the other one, from which visible growth develops. In warm and humid climates, many terrestrial orchids do not need pseudobulbs. Epiphytic orchids have modified aerial roots that can sometimes be a few meters long. In the older parts of the roots, a modified spongy epidermis called velamen has the function to absorbe humidity. It is made of dead cells and can have a silvery-grey, white or brown appearance. The cells of the root epidermis grow at a right angle to the axis of the root to allow them to get a firm grasp on their support. Nutrients mainly come from animal droppings and other organic detritus on their supporting surface. The base of the stem of sympodial epiphytes, or in some species essentially the entire stem, may be thickened to form what is called a pseudobulb that contains nutrients and water for drier periods. The pseudobulb has a smooth surface with lengthwise grooves and can have different shapes, often conical or oblong. Its size is very variable; in some small species of Bulbophyllum it is no longer than two millimeters, while in the largest orchid in the world, Grammatophyllum speciosum (giant orchid), it can reach three meters. Some Dendrobium have long, canelike pseudobulbs with short, rounded leaves over the whole length, some other orchids have hidden or extremely small pseudobulbs, completely included inside the leaves. With ageing the pseudobulb sheds its leaves and becomes dormant. At this stage it is often called a backbulb. A pseudobulb then takes over, exploiting the last reserves accumulated in the backbulb, which eventually dies off too. A pseudobulb typically lives for about five years. Orchidaceae are well known for the many structural variations in their flowers. 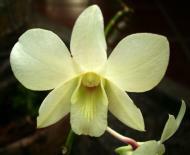 Some orchids have single flowers but most have a racemose inflorescence, sometimes with a large number of flowers. 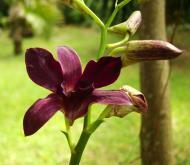 The flowering stem can be basal, that is produced from the base of the tuber, like in Cymbidium, apical, meaning it grows from the apex of the main stem, like in Cattleya, or axillary, from the leaf axil, as in Vanda. As an apomorphy of the clade, orchid flowers are primitively zygomorphic (bilaterally symmetrical), although in some genera like Mormodes, Ludisia, Macodes this kind of symmetry may be difficult to notice. 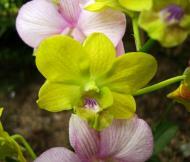 The orchid flower, like most flowers of monocots has two whorls of sterile elements. The outer whorl has three sepals and the inner whorl has three petals. The sepals are usually very similar to the petals (and thus called tepals, 1), but may be completely distinct. The upper medial petal, called the labellum or lip (6), is always modified and enlarged. The inferior ovary (7) or the pedicel usually rotates 180 degrees, so that the labellum, goes on the lower part of the flower, thus becoming suitable to form a platform for pollinators. This characteristic, called resupination occurs primitively in the family and is considered apomorphic (the torsion of the ovary is very evident from the picture). 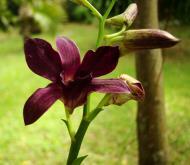 Some orchids have secondarily lost this resupination, e. g. Zygopetalum and Epidendrum secundum. The normal form of the sepals can be found in Cattleya, where they form a triangle. In Paphiopedilum (Venus slippers) the lower two sepals are fused together into a synsepal, while the lip has taken the form of a slipper. In Masdevallia all the sepals are fused. Orchid flowers primitively had three stamens, but this situation is now limited to the genus Neuwiedia. Apostasia and the Cypripedioideae have two stamens, the central one being sterile and reduced to a staminode. All of the other orchids, the clade called Monandria, retain only the central stamen, the others being reduced to staminodes (4). The filaments of the stamens are always adnate (fused) to the style to form cylindrical structure called the gynostemium or column (2). In the primitive Apostasioideae this fusion is only partial, in the Vanilloideae it is more deep, while in Orchidoideae and Epidendroideae it is total. The stigma (9) is very asymmetrical as all of its lobes are bent towards the centre of the flower and lay on the bottom of the column. Pollen is released as single grains, like in most other plants, in the Apostasioideae, Cypripedioideae and Vanilloideae. 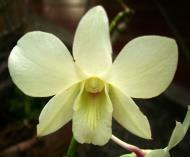 In the other subfamilies, that comprise the great majority of orchids, the anther (3), carries and two pollinia. A pollinium is a waxy mass of pollen grains held together by the glue-like alkaloid viscin, containing both cellulosic stands and mucopolysaccharides. Each pollinium is connected to a filament which can take the form of a caudicle, like in Dactylorhiza or Habenaria or a stipe, like in Vanda. Caudicles or stipes hold the pollinia to the viscidium, a sticky pad which sticks the pollinia to the body of pollinators. At the upper edge of the stigma of single-anthered orchids, in front of the anther cap, there is the rostellum (5), a slender extension involved in the complex pollination mechanism. As aforementioned, the ovary is always inferior (located behind the flower). It is three-carpelate and one or, more rarely, three-partitioned, with parietal placentation (axile in the Apostasioideae). 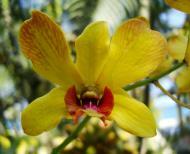 Orchids have developed highly specialized pollination systems and thus the chances of being pollinated are often scarce. This is why orchid flowers usually remain receptive for very long periods and why most orchids deliver pollen in a single mass; each time pollination succeeds thousands of ovules can be fertilized. Pollinators are often visually attracted by the shape and colours of the labellum. The flowers may produce attractive odours. Although absent in most species, nectar may be produced in a spur (8) of the labellum, on the point of the sepals or in the septa of the ovary, the most typical position amongst the Asparagales. 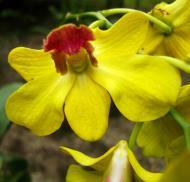 In orchids that produce pollinia, pollination happens as some variant of the following. When the pollinator enters into the flower, it touches a viscidium, which promptly sticks to its body, generally on the head or abdomen. While leaving the flower, it pulls the pollinium out of the anther, as it is connected to the viscidium by the caudicle or stipe. The caudicle then bends and the pollinium is moved forwards and downwards. When the pollinator enters another flower of the same species, the pollinium has taken such position that it will stick to the stigma of the second flower, just below the rostellum, pollinating it. The possessors of orchids may be able to reproduce the process with a pencil or similar device. Some orchids mainly or totally rely on self-pollination, especially in colder regions where pollinators are particularly rare. The caudicles may dry up if the flower hasn't been visited by any pollinator and the pollina then fall directly on the stigma. Otherwise the anther may rotate and then enter the stigma cavity of the flower (as in Holcoglossum amesianum). 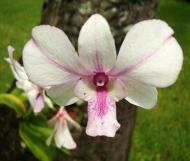 The labellum of the Cypripedioideae is poke-shaped and has the function to trap visiting insects. The only exit leads to the anthers that deposit pollen on the visitor. In some extremely specialized orchids, like the Eurasian genus Ophrys, the labellum is adapted to have a colour, shape and odour which attracts male insects via mimicry of a receptive female. Pollination happens as the insect attempts to mate with flowers. Many neotropical orchids are pollinated by male orchid bees, which visit the flowers to gather volatile chemicals they require to synthesize pheromonal attractants. Each type of orchid places the pollinia on a different body part of a different species of bee, so as to enforce proper cross-pollination. An underground orchid in Australia, Rhizanthella slateri, never sees the light of day and depends on ants and other terrestrial insects to pollinate it. Catasetum, a genus discussed briefly by Darwin actually launches its viscid pollinia with explosive force when an insect touches a seta, knocking the pollinator off the flower. After pollination the sepals and petals fade and wilt, but they usually remain attached to the ovary. Some species, as some Phalaenopsis, Dendrobium and Vanda, produce offshoots or plantlets formed from one of the nodes along the stem, through the accumulation of growth hormones at that point. These shoots are known as keiki. The ovary typically develops into a capsule that is dehiscent by 3 or 6 longitudinal slits, while remaining closed at both ends. The ripening of a capsule can take 2 to 18 months. The seeds are generally almost microscopic and very numerous, in some species over a million per capsule. After ripening they blow off like dust particles or spores. They lack endosperm and must enter symbiotic relationship with various mycorrhizal basidiomyceteous fungi that provide them the necessary nutrients to germinate, so that all orchid species are mycoheterotrophic during germination and reliant upon fungi to complete their lifecycle. As the chance for a seed to meet a fitting fungus is very small, only a minute fraction of all the seeds released grow into an adult plant. In cultivation, germination typically takes weeks, while there is a report of one paphiopedilum that took fifteen years. Horticultural techniques have been devised for germinating seeds on a nutrient-containing gel, eliminating the requirement of the fungus for germination, greatly aiding the propagation of ornamental orchids. The main component for the sowing of orchids in artificial conditions is the agar agar. The substance is put together with some type of carbohydrate (actually, some kind of glucose) which provides qualitative organic feed. Such substance may be banana, pineapple, peach or even tomato puree or coconut milk. After the cooking of the agar agar (it has to be cooked in sterile conditions) the mix is poured into test tubes or jars where the substance begins to jelly. The seeds have to be put in the dish above boiling water, in the steam because that secures sterile conditions. The test tubes are put diagonally after that. 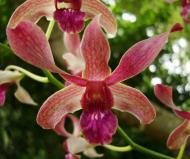 A study in the scientific journal Nature has shown that the origin of orchids goes back much longer than originally expected. An extinct species of stingless bee, Proplebeia dominicana, was found trapped in Miocene amber about 15-20 million years ago. The bee was carrying pollen of a previously unknown orchid taxon, Meliorchis caribea, on its wings. This indicates that orchids may have an ancient origin and have arisen 76 to 84 million years ago during the Late Cretaceous. In other words, they may have co-existed with dinosaurs. It shows also that at that time insects were active pollinators of orchids. 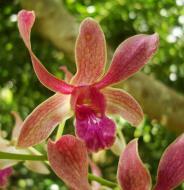 Using the molecular clock method, it was possible to determine the age of the major branches of the orchid family. This also confirmed that the subfamily Vanilloideae is a branch at the basal dichotomy of the monandrous orchids, and must have evolved very early in the evolution of the family. Since this genus occurs worldwide in tropical and subtropical regions, from tropical America to tropical Asia, New Guinea and West Africa, and the continents began to split about 100 million years ago, significant biotic exchange must have occurred after this split (since the age of Vanilla is estimated at 60 to 70 million years). The underground tubers of terrestrial orchids (mainly Orchis mascula' or Early Purple Orchid) are ground to a powder and used for cooking, such as in the hot beverage salep or the so-called "fox-testicle ice cream" salepi dondurma. The scent of orchids is frequently analysed by perfumists (using Gas-liquid chromatography) to identify potential fragrance chemicals. 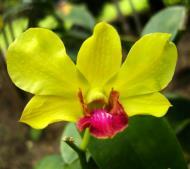 The other important use of orchids is their cultivation for the enjoyment of the flowers. Most cultivated orchids are tropical or subtropical, but quite a few which grow in colder climates can be found on the market. Temperate species available at nurseries include Ophrys apifera (Bee Orchid), Gymnadenia conopsea (Fragrant Orchid), Anacamptis pyramidalis (Pyramidal Orchid) and Dactylorhiza fuchsii (Common Spotted Orchid). 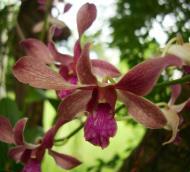 Orchids of all types have also often been sought by collectors of both species and hybrids. As such many hundreds of societies and clubs worldwide have been established. These can be small local clubs like Sutherland Shire Orchid Society or larger national organisations like American Orchid Society. 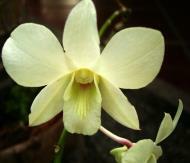 Both serve to encourage cultivation and collection of orchids, but some go further by concentrating on conservation or research. The term botanical orchid loosely denotes those small flowered tropical orchids belonging to several genera (not necessarily related to each other) that don't fit into the "Florist" orchid category. A few of these genera contain enormous numbers of species. Some, such as Pleurothallis and Bulbophyllum, contain approximately 1700 and 2000 species, respectively, and are often extremely vegetatively diverse. 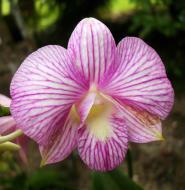 The primary use of the term is among orchid hobbyists wishing to describe unusual species they grow, though it is also used to distinguish naturally occurring orchid species from horticulturally created hybrids. 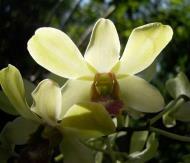 The following are amongst the most notable genera in the very large orchid family. Aa; Abdominea; Acampe; Acanthephippium; Aceratorchis; Acianthus; Acineta; Acrorchis; Ada; Aerangis; Aeranthes; Aerides; Aganisia; Agrostophyllum; Amitostigma; Anacamptis; Ancistrochilus; Angraecum; Anguloa; Ansellia; Aorchis; Aplectrum; Arethusa; Armodorum; Ascocenda; Ascocentrum; Ascoglossum; Australorchis; Auxopus; Baptistonia; Barbrodia; Barkeria; Barlia; Bartholina; Beloglottis; Biermannia; Bletilla; Brassavola; Brassia; Bulbophyllum; Calypso; Catasetum; Cattleya; Cirrhopetalum; Cleisostoma; Clowesia; Coelogyne; Coryanthes; Cymbidium; Cyrtopodium; Cypripedium; Dactylorhiza; Dendrobium; Disa; Dracula; Encyclia; Epidendrum; Epipactis; Eria; Eulophia; Gongora; Goodyera; Grammatophyllum; Gymnadenia; Habenaria; Herschelia; Laelia; Lepanthes; Liparis; Ludisia; Lycaste; Masdevallia; Maxillaria; Meliorchis, Mexipedium; Miltonia; Mormodes; Odontoglossum; Oncidium; Ophrys; Orchis; Paphiopedilum; Paraphalaenopsis; Peristeria; Phaius; Phalaenopsis; Pholidota; Phragmipedium; Platanthera; Pleione; Pleurothallis; Promenaea; Pterostylis; Renanthera; Renantherella; Restrepia; Restrepiella; Rhynchostylis; Roezliella; Saccolabium; Sarcochilus; Satyrium; Selenipedium; Serapias; Sophronitis; Spiranthes; Stanhopea; Stelis; Thrixspermum; Trias; Trichocentrum; Trichoglottis; Vanda; Vanilla; Zeuxine; Zygopetalum.